A pleasant afternoon spent relaxing by the pool on your outdoor patio furniture. Friends and family gather. An evening sky aglow with another glorious sunset. The delight of dining al-fresco. Such are the rewards of the outdoor lifestyle. Since 1954, Tropitone has maintained a tradition of excellence in the design and manufacture of casual indoor and outdoor patio furniture, pool furniture, contract and hospitality furnishings, patio umbrellas, market umbrellas and shade solutions. If it's outdoors, we furnish it. Tropitone helps you create living solutions for outdoor spaces with outdoor patio furniture designs from gracious traditional looks in highly-detailed cast aluminum to contemporary choices at home in the most modern surroundings. And from glass top round patio dining tables to the latest sling outdoor chairs and chaise lounges, Tropitone delivers the widest section of patio furniture styles, finishes, colors and fabrics. So not only is our outdoor patio furniture among of the very highest quality, but everything we do is "customizable" with our over 200 fabric options and varied finish palette. 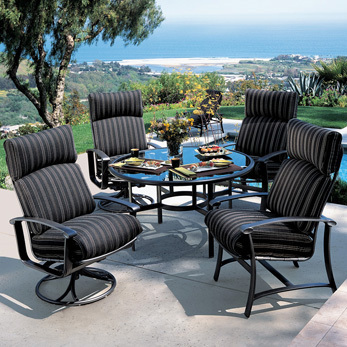 All so you can create the perfect outdoor patio furniture environment. An environment you can count on for years of impeccable, personal style. Tropitone outdoor patio furniture is available through top commercial designers, or our network of exclusive outdoor furnishings dealers. So whether you're designing the pool area for a destination resort or turning your own back yard into a destination, you get just the look you're looking for.